North Carolina avenged its earlier loss to Duke on Senior Night, but with the ACC and NCAA tournaments approaching the Tar Heels are keenly aware of their ultimate goal. CHAPEL HILL, N.C. — To review, Duke and North Carolina played an extremely good basketball game Saturday night. Michael Jordan took the floor at halftime and shared interesting philosophical views regarding ceilings and roofs. Grayson Allen took inordinate heat from the Smith Center crowd before the game even began, then took his elbow to the face of a Tar Heels player to earn a technical foul, then hit a couple big shots, then missed some free throws, all of it whiplashing 21,750 people between rage and a delight that was actually also kind of rage-like. The Blue Devils’ Luke Kennard hit two bank-shot jumpers on the way to a 28-point effort that doubled as an ACC Player of the Year statement. The Tar Heels’ Joel Berry didn’t miss any of his five three-point tries and piled up 28 propulsive points of his own. The lead changed hands 23 times. There were 14 ties. As ever, the programs met twice this year, and two better games may not have been played anywhere. The result this time was North Carolina 90, Duke 83. The roadmap it offered to both for the postseason to come was simple and utterly the same. The parsing of game film will give rise to imperfections and corrections before the ACC tournament, but that’s more reflex than reflection of what went on Saturday. The Tar Heels commemorated a regular-season league title by cutting down their own nets, and they appear convincingly equipped to repeat the ritual at least one or two more times. The Blue Devils emerged from another rash of injuries with a lineup that at least vaguely resembled the one that had people heaving championship expectations their way, and that group nearly beat a future No. 1 seed on the road. 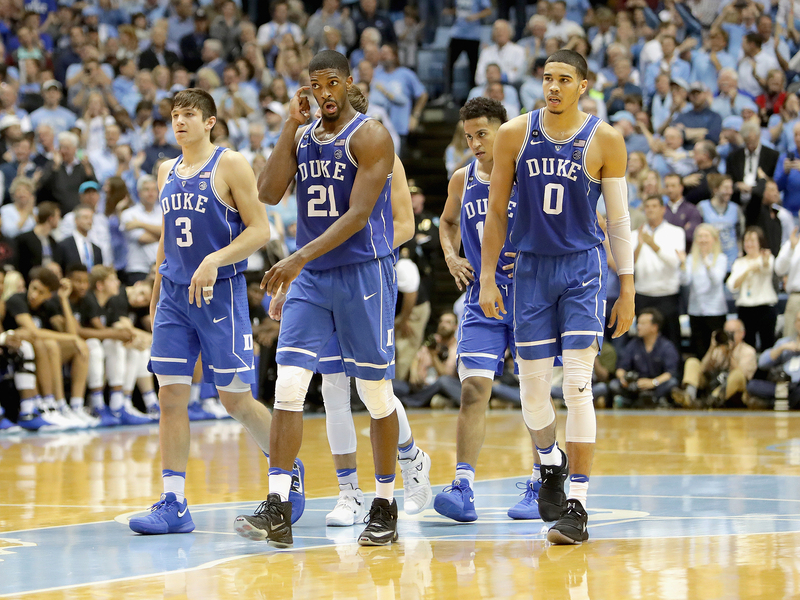 The game mattered in the way Duke-North Carolina always matters, but it mattered in the more substantial way of addressing a nagging suspicion that both sides entered the postseason with something to prove. Although it is not exactly a suspicion with the Tar Heels. Berry flung the ball into the air at the buzzer and the team smiled and laughed through the net-cutting that kept them on the floor until nearly 11 p.m. local time, and you might not have realized they were precisely 11 months removed from the worst basketball moment of their lives. Which was fine. North Carolina remembers well enough for everyone else. • Bracket Watch: Which teams are in the hunt for a No. 1 seed? Against Duke, the Tar Heels certainly made the better of the night’s two public statements about potential. To memorialize an apparel deal with his alma mater’s football program, Michael Jordan took the floor at halftime and thanked the crowd for the ovation and the hospitality. “The ceiling is the roof,” Jordan then said of his brand’s new partnership, and turning back the clock was suddenly very much on everyone’s mind. Fortunately for the Smith Center patrons, the current batch of North Carolina players offered a less perplexing commentary on possibility. Isaiah Hicks, inconsistent for almost a month, reasserted himself with 21 points and nine rebounds. Where Jackson struggled (6 of 17 shooting, just 1 of 7 from long range), Berry II more than compensated. The defense triggered just in time, limiting the Blue Devils to 36.7% shooting in the second half. A reinvigorating effort against this opponent was auspicious for a team unable to stop looking back as it forged ahead. It was, meanwhile, time to stop wondering about Duke. For a lot of reasons. To begin with, the entire year has been spent wondering about the Blue Devils as they navigated injuries and controversies and Krzyzewski’s absence due to back surgery. It’s now a waste of energy to calculate if Duke will be the Duke everyone expected them to be; either that team will show up when it truly matters, at some NCAA tournament site in a little less than two weeks, or it won’t. • As elite coaches face twilight, who will follow legends at Duke, UNC? The faults were small enough to seem insignificant. Krzyzewski opened his postgame remarks by noting that both teams were worthy of winning both of their meetings this season, and he wasn’t wrong. “It was a big-time game,” Williams declared. Duke and North Carolina indeed can enter the postseason feeling assured, so long as they do to everyone else what they did to each other on Saturday. The Blue Devils showed enough to suggest they can be something like the team everyone expected them to be this year. The Tar Heels again demonstrated they can be the team they were a year ago. After a raucous, pulse-racing night of very good basketball, there wasn’t a compelling reason to put a ceiling or a roof on anything.